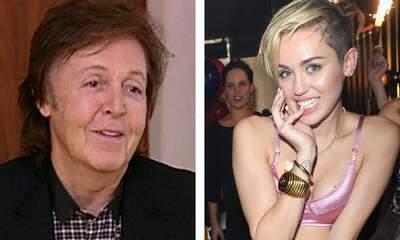 Sir Paul McCartney has told Sky News there was nothing wrong with Miley Cyrus' bump and grind moves at the MTV awards, saying: "Come on, we've seen worse than that!" The former Beatle told Sky presenter Charlotte Hawkins he was also happy for his 10-year-old daughter to watch the singer's twerking dance moves she has become synonymous with. He said: "I watched it as an experiment to check, but you look at it and you say 'what's everyone shouting about?'. "I think it was only mildly shocking ... it wasn't explicit at all." Sir Paul is promoting his latest album, New, which is his 16th solo album. He said: "It's not difficult to come up with something new, but to come up with something new which is good is difficult because you're stacking them against the stuff you've done - but you've got to just forget that. "I love writing songs so I just have to say 'don't even try to better the old ones, just get on with it'. "But I love doing it so much that I can't stop." Asked about what he thinks about bands like One Direction being compared with The Beatles, Sir Paul said: "I always think it's unfortunate for a band to be called the new Beatles because it can be the kiss of death. "People expect you to live up to what we did, and we did what we did in a particular period in time, which is very different from now." He added: "I don't know whether it was easier to be a wild success then, but it was different. "But I like One Direction. They're young, beautiful boys and that's the attraction. But they can sing and they make good records, so that's what I can see in common - and that the girls love them."